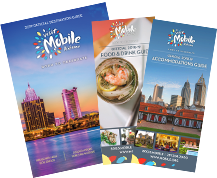 Mobile has long been a favored stop on many tour groups' Gulf Coast itineraries. Just two hours east of New Orleans and one hour north of the beautiful Gulf of Mexico beaches, Mobile's historic appeal, wonderful attractions, local restaurants and special events are sure to please groups of all sizes. Mobile is easily accessible east/west on Interstate 10 and north/south on Interstate 65. Mobile has also been a popular gathering spot for weddings, receptions, family reunions and other group getaways - come find out why (hint: we love to throw a party)! Let us help you customize your itinerary - we can assist with planning of the below tours or are happy to work with you on other ideas for your groups.